Phantom Billstickers has announced a partnership with the NZ Book Awards Trust to promote National Poetry Day – the biggest nationwide poetry event of the year. 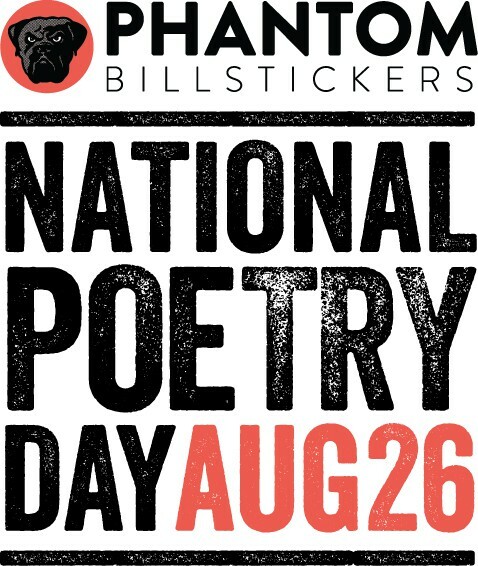 The 19th National Poetry Day will now be known as Phantom Billstickers National Poetry Day and will continue to bring poetry to the people, with over 80 events held nationwide, involving everyone from seasoned award winners to aspiring poets facing the microphone for the first time. Phantom Billstickers National Poetry Day will be held on Friday 26 August, continuing the legacy of taking poetry to the people from Kerikeri to Southland, across the streets of small towns and major cities. “It’s an opportunity to hear more poetry – there’s the possibility to take it back to the regions that built us,” says Jim Wilson, owner of Phantom. He says Phantom Billstickers National Poetry Day is about discovery, diversity, community and pushing boundaries. Poetry enthusiasts generate events such as slams, poetry-music jams, poetry art exhibitions, performance poetry, poetry and dance, poetry street chalking, bookshop and library readings, open mic events and poetry writing competitions. This was established as a charitable trust in 2014 to govern and manage the country’s two major literary awards and National Poetry Day, and to ensure their longevity and credibility. New sponsorship agreements have now been secured for all three properties with Ockham supporting the Book Awards, Hell Pizza backing the Children’s and Young Adult awards via its support of the Reading Challenge and Children’s Choice programmes, and Phantom National Poetry Day. Additional funders include The Acorn Foundation, Book Tokens Ltd, Creative NZ, Copyright Licensing Ltd, the Fernyhough Education Foundation, Nielsen and Wellington City Council, supporting specific aspects of the properties. Jeanne Bernhardt, Gavin Shaw, Genevieve McClean, James George, Nidar Gailani, Nicky Taylor, Michael O’Leary, Chris Knox, Stephen Oliver, Kay McKenzie Cooke, Peter Olds, Michael Gould, Ivy Alvarez, Wayne Seyb, Dominic Hoey, Alan Harold, Buster Stiggs. Available for digital download on Kindle and iPad for a small fee on Amazon.com here. 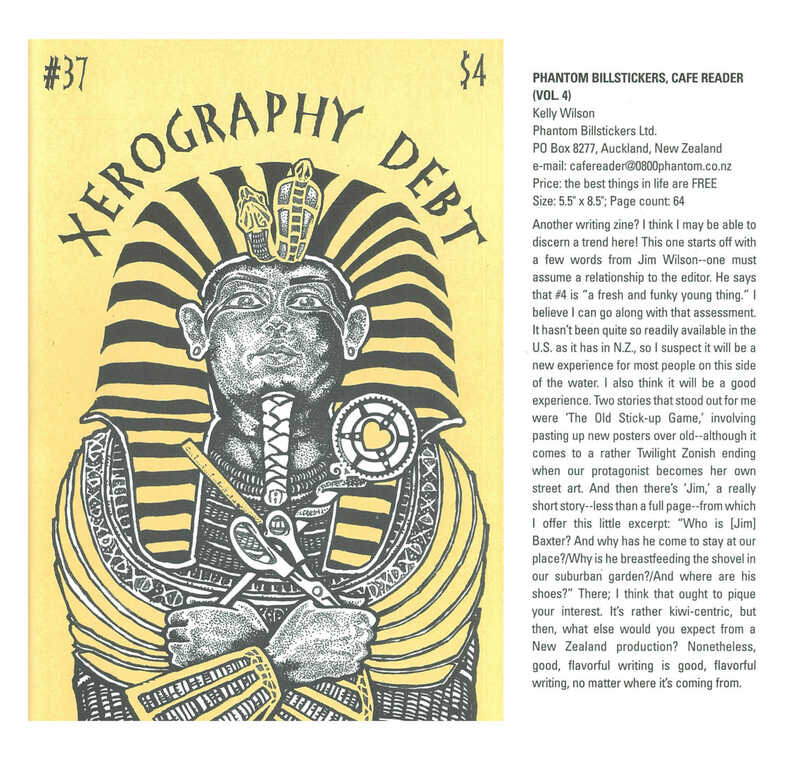 The Phantom Billstickers Cafe Reader is published quarterly with 12 to 15 authors typically appearing in each issue. We are interested in submissions for the ‘zine in the form of short stories or editorial with a word count of 3000 words or less. We also publish poems in the ‘zine but there is typically no more than three per issue so space is usually quite limited. Submissions to the Cafe Reader must be previously unpublished in any format. Copyrights are retained by the author. However, the author agrees that Phantom Billstickers has the right to use the piece in both the Cafe Reader hard copy and digital formats (currently available for download on Amazon.com) for both domestic and international distribution. By submitting, the author agrees that the piece published in the Cafe Reader will not be published in any other format between the publication date of the issue where it appears and the publication date of the next quarterly issue of the Cafe Reader. We do not guarantee which issue any piece will appear in. When a piece is scheduled to appear a layout will be provided to the author for review and approval prior to publication. Submissions must be provided in an editable WORD document submitted via email to submissions-cafereader@0800phantom.co.nz. The author should provide some background information about themselves in conjunction with the submission. Labeling the file with the author’s name is appreciated. 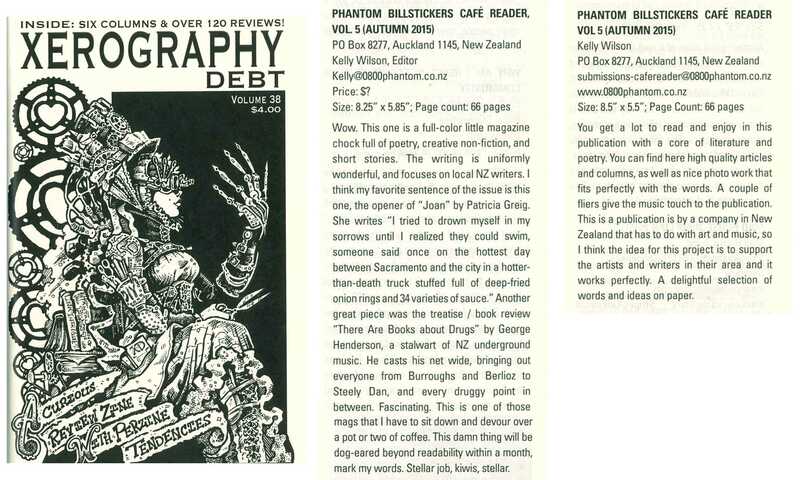 The Phantom Billstickers Cafe Reader is a quarterly literary zine featuring short stories, poems, art and editorial by New Zealanders. The stories we publish are heartfelt glimpses into family, community, and the more colourful aspects of the creative life in New Zealand. 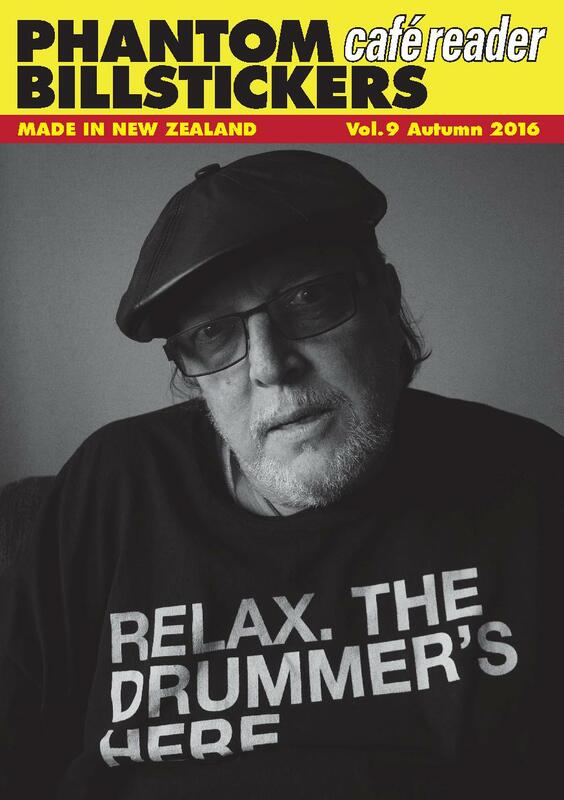 Many of our articles and stories revolve around Kiwi music. Our contributors range from globally recognized Kiwi authors to emerging artists who deserve to be heard. Reviews by Josh Medsker and Carlos Palacios respectively. If you’d like to get copies of the Phantom Billstickers Cafe Reader, contact briana@0800phantom.co.nz or via our Facebook page to be added to our mailing list. Alternatively, all the issues can be downloaded for a small fee from Amazon.com for our international readers.